Antique kilims are those which were made by the ancient civilizations of Turkey, Persia, Afghanistan and other parts of the Orient. Kilims are flat tapestry woven carpets and rugs. They are less durable than usual rugs and carpets. They are also used as floor coverings. Because they are tapestry woven, kilims are also utilized as wall hangings. They render an ornamental feel to the room and improve the overall décor. They also lend an old world charm to the ambience. Their demand is steadily mounting because of their rarity, beauty, quality and utility and we at Rug Store are an authentic source of such kilims. Many people collect them because they feel a connection with them. Socioeconomic, environmental, religious, cultural, and sociopolitical situations led to the production of kilim rugs in ancient Turkey. They most probably have their roots in the migratory Turkic people of the medieval Seljuk period. They were manufactured in large numbers for the court and for exporting purposes. Turkish kilims, rugs and carpets were produced in myriad varieties and have their origin in different regions of Anatolia. So, they are also called Anatolian kilims. These kilims, rugs and carpets can be differentiated by their ways of manufacturing, depicted symbols, employed materials in their making, patterns and styles, geographical and cultural influences and their expected utility. Wool was the most favored fabric; cotton and silk were also used. The distinguishing feature of antique kilims of that period is the extensive use of symbols woven on the kilims. Kilims, rugs and carpets were a defining part of the Persian culture. Their origin can be dated back as early as the Bronze Age and the ancient Persia. Wool was the material of choice whereas cotton and silk were also used to some degree. 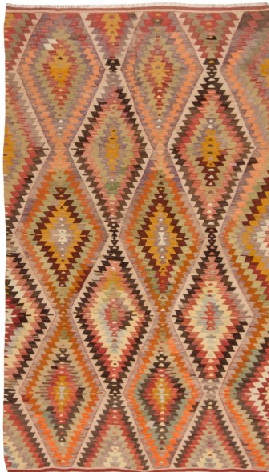 Kilims were made almost exclusively for domestic use unlike carpets which were also exported. The designs, patters and styles of such kilims were complex, elaborate and they depicted symbols depending on the geography and culture of the manufacturing areas. They are among the very best, most intriguing and sought after kilims in the world. They were so brilliant that their style was copied in other parts of the world. The oldest creations underwent changes in the succeeding eras although their main style, pattern and scintillating craftsmanship remained the same. Except the above mentioned regions which come under the Orient, other parts of Orient also produced kilims and rugs which still remain as a reminder of exceptional human brilliance. China made kilims and rugs for indigenous use. These can be detected back to the last monarch of the Chen Dynasty. These carpets had different production techniques, different styles and designs pertaining to different regions. Armenian kilims deserve special mention because of their dazzling workmanship and elaborate designs which represent the sacred symbols of the then Armenian culture. Oldest of the Armenian kilims in the records is of the 7th century B.C. Kilims from India mainly Jaipur and Kashmir are quite old and their designs are intricate that depict Indian kings, cultures and floral patterns. Owning the perfect and most credible antique kilims is not an easy task. It needs time, interest, market and online research and consultation with experts. 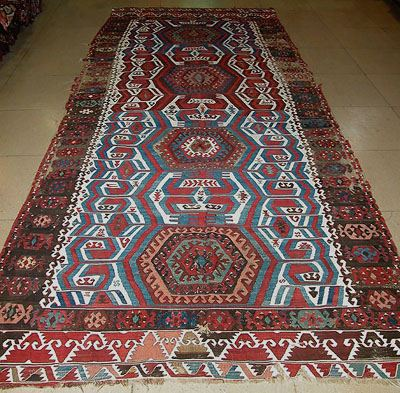 Rug Store is committed to help you get hold of the best antique kilims available. Our experience, competence and dedicated customer service is second to none. Once you come to us, you will definitely feel at home. 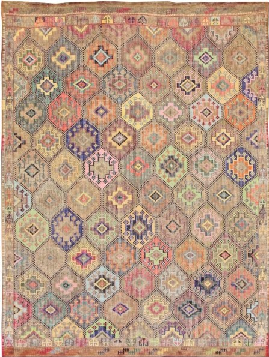 Copyright © antiquekilims.co.uk. All Rights Reserved.